Victoria has plenty to offer and no other tour offers so much in a single day package. To experience the very best of Victoria in a single day, enjoy CVS Tours "Best of Victoria" Tour. You will travel by deluxe motor coach through downtown Victoria along the Government Street Plaza to Chinatown and the Gates of Harmonious Interest. Our first stop is Craigdarroch Castle, a late 1800's mansion with exquisite wood and stained glass craftsmanship - the Castle is a National Historic site. We will travel along the Marine Drive scenic route before heading to the highlight of our tour - the spectacular Butchart Gardens, started as a limestone quarry at the turn of the last Century - the Gardens has grown over the past century to become one of the most famous show Gardens in the World. Enjoy Tea on the Knee, a casual style lunch that is a cross between a picnic on the grounds and Afternoon Tea. Find your own part of this spectacular setting to enjoy this delicious, boxed lunch prepared by the Butchart Gardens dining room. Over 50 acres of colors and fragrances are a feast for the senses. You are free to walk the grounds, visit the gift shop or various eateries. Our next stop is Church & State Winery for a Wine Tasting and Winery Tour. The name Church & State symbolizes a balance between the many elements involved in creating the highest quality wines. Find balance in the climate of this region, in the growing of grapes, the aging of Church & State wines in the finest French oak barrels and in the premium vintages that are produced. Not a wine aficionado? You have the option of a behind the scenes tour of the Tropical Indoor Jungle that is Victoria Butterfly Gardens - your guide will show you the variety of plants and animals including South American "poison" dart frogs, tropical birds and colorful butterflies. 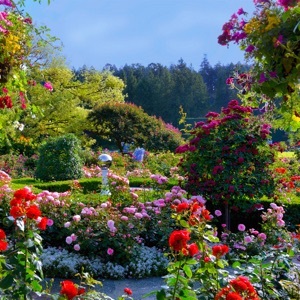 There is no extra charge as either wine tasting or Butterfly Gardens is included in our Victoria Day Tour - The Best of Victoria. We travel north to Sidney by the Sea, a seaside community with unique bookstores, shops and the best bakery on the lower Island. During the free time here, visit the Sidney Pier or Shaw Ocean Discovery Centre. This is an opportunity for some shopping or leisurely time gazing out at the ocean on the scenic waterfront. PLEASE NOTE: Tour is available from June 19 to August 29, 2015.